Saturday, May 31st, 2014: Gulf of Esquibel to Port Alexander. It was already bright at 5AM as we prepped for our cruise to Port Alexander. The weather seemed OK but strong winds were forecast for later in the day. First we followed up the SE side of Heceta Island over the top of Warren Island, and then crossed southern Sumner Strait with just a low, well-spaced swell. It was so nice, the band began to practice again performing many popular songs of the 70's and 80's.... our generation? The Beatles, Stones, etc filled the boat as Alex hummed along. We carefully planned to make the 9AM slack water at Cape Decision and cleared Decision Passage a bit early. The sounder was displaying lots of bait and crew Ken, and mandolin master, noticed hundreds of birds feeding nearby, a sure sign of bait and game fish. We then drifted fish just west of the Passage pulling up several big Blue Cod and a 46-lb Halibut. After "deciding" to fish Cape Decision, the big decision now became a dinner one ..... Blue Cod or Halibut tacos? Cape Decision lighthouse. We "decided" to fish just west of here. We overcame our great desire to continue fishing, and after less than an hour, we thought it best to cross southern Chatham Strait while the conditions stayed favorable. Chatham's 3-foot seas made for a good ride and we entered Port Alexander just before 1PM joining the mass of fish boats crowded alongside the single float. coolers with ice from the commercial fishing supply vessel Hyak. Small float with lots of fish boats. Port Alexander is a town of 81 full-time residents. Port Alexander once was a bustling city with as many as 2,500 people in the early 20th century, featuring brothels and its own token system of currency. Prior to the 1920s, Port Alexander was the salmon fishing capital of the world. Today 81 locals make the town their year-round home. Side-tied to a smaller troll boat, we were able to get our cooler filled with ice. The Hyak, a commercial supply boat, was offloading fish supplying ice to the fishing fleet. This made for lots of activity around the float. That, coupled with float planes landing and departing nearby, drove us to leave Port Alexander for a quite anchorage. Just behind Port Alexander is Port Conclusion, aptly named by Captain Vancouver in 1794 as his last base for the exploration of the Northwestern waters. Ship Cove provided a fair anchorage even in the brisk afternoon winds. Crew Gerard donned his wet-suit examined the hull of Wild Blue, swam ashore, and snorkeled the depths for sea life. I can't remember if it was Blue Cod or Halibut tacos, but they were tasty! Friday, May 30, 2014: From Tlevak Narrows, past Craig, through the Portillo Channel squeeze, to the Gulf of Esquibel. With slack current at Tlevak Narrows around 6am, we were pulling our crab traps by 5:30. Lucky for us three large males enjoyed the salmon head buffet offered by the Wild Blue crew. Then they road the elevator to the surface and into a boiling pot of sea water seasoned with Pappys. We cleared the Narrows on time sharing the slim channel with a group of about 15 Orcas. This is probably the same pod we encountered last year near Craig that performed flips and rolls to the delight of our video cameras. You can see their performance here. Lodge, a sports fisherman's dream inn. The shortest route to the Gulf of Esquibel is through Portillo Channel. It's a shallow channel with plenty of kelp and best to transit at high slack water. We arrived there a bit early and decided to troll the eastern shores of St. Ignace and San Fernando Islands. After an hour it was clear the fish were not close-in yet this early in the season. So we cautiously transited Portillo entering the Gulf at noon. We then trolled the top of Noyes Island and San Lorenzo Islands without success. Finally we drifted the eastern edge of Escurial Island hoping for rock fish. After 12 hours of cruising, trolling, rock fishing and band practice, we set the anchor due south of Tonina Island sharing the small bay with a feeding humpback, and dined on fresh crab. Three male crabs ready to taste. We left San Luis Obispo just after 1AM for our early morning flight from San Jose. This put us in Ketchikan by noon and we quickly provisioned, then exited Bar Harbor Marina SW bound to Cape Chacon and Prince of Wales Island at 2:30PM. We're taking the "open ocean" route to Sitka: that is outside POW Island, past Craig, across Sumner Strait, around Cape Decision, across Chatham Strait, around Cape Ommaney, then up Baranof Island's west coast to Sitka. It's the shortest route, affords plenty of fishing opportunities, but exposes us to the bumpier ride of unprotected Gulf of Alaska. Good weather should help us out over the next several days. Our crew for the next 10 or so days is Gerard Ages and Ken Bruton, both of Los Osos, California. Gerard is an old friend and general contractor who has completed several real estate projects for us. He's also runs his own fishing boat out of Morro Bay and is quite successful. This is about his 4th cruise on the Wild Blue. Ken is works as a project manager in general contracting for the service stations in the Central Coast area. He also does lots of ocean fishing in and around Morro Bay. We look forward to being in the rough and tumble Gulf of Alaska with these experienced mariners. The open ocean route from Ketchikan to Sitka. By 8PM we rounded Cape Chacon in 4-foot ocean chop. About the same time an 83-foot US Coast Guard boat hailed us on VHF. They wanted to know our last port, planned destination and number aboard. We complied and they thanked us. We were happy to not be boarded for inspection. This is the first time that has occurred in for us in Alaska waters. Just after sunset at 10PM we anchored at the S end of Hessa Island. This is a calm, quiet, and sheltered spot. We quickly dropped off to sleep having been awake the last 22 hours. Thursday, May 29, 2014: It pays to be kind. The Wild Blue was unhooked by 7AM and NW bound towards Craig. The idea was to stop and do some fishing if we found a fishy place. Wallace Rock looked good so we dragged the bait around it for an hour without success. It was good to test out the new Cannon down-riggers and get the equipment kinks worked out. At 10AM up Tlevak Strait, we received a call from the tug Avery O which was crossing us. Wild Blue being on tug Avery O's starboard side meant we had the right-of-way. At less than 6 knots this tug had a big load, so we offered to change course saying "We're just pleasure boaters, and you're a working tug." His response was "Thanks, and if your pleasure is fishing, you're about to pass one of the best King salmon areas this side of POW Island. The S and E sides of Jackson Island are it." By the time tug Avery O crossed us, we had trolled for 20 minutes and landed our first King of the season. We quickly called back the tug and thanked the skipper for his tip. It pays to be kind! and quickly landed three huge king salmon! It pays to be kind. 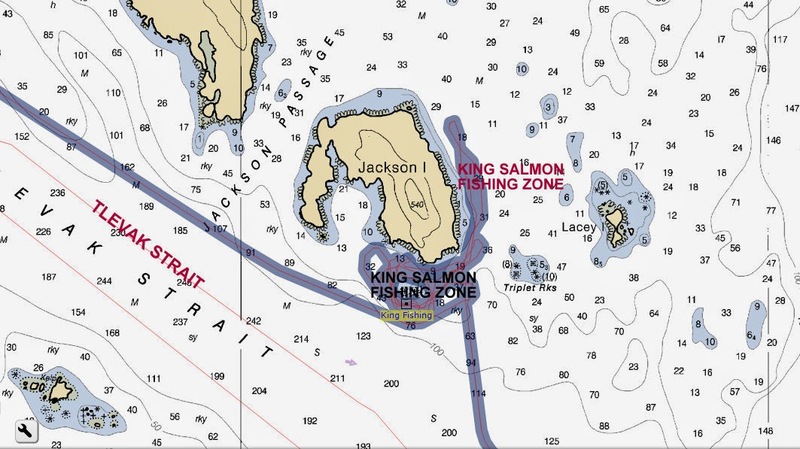 Don't miss Jackson Island King salmon fishing zone when in Tlevak strait. After three fish in the box we again moved up the Strait to Soda Bay, located just before the Tlevak Narrows, and anchored in Shelikof Island's fine bay. We sent the crab traps, dined on BBQ fresh salmon, and promptly dozed off. On Saturday, after resting up a few days in Ketchikan, we decided on a short weekend cruise to nearby Prince of Wales Island. We looked for an anchorage protected from the forecast SE winds and Kasaan Bay on POW's east coast offered several options. Unfortunately the Douglass Guide didn't provide much info for the closer ones that looked good on the chart. 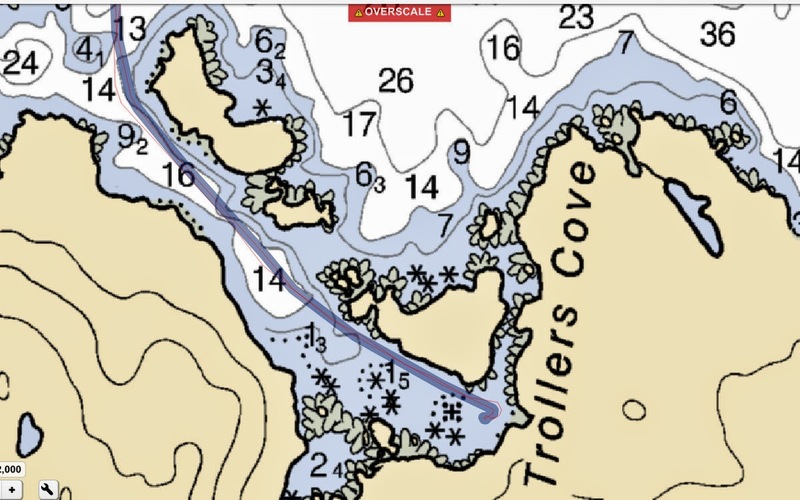 We Googled "Troller Cove" to find a sailboat blog describing a beautiful bay with a forest cabin and resident bear. The Douglass Guide stated "Trollers Cove is inadequately charted but it does appear to offer good shelter in all weather". Poor charts and a resident bear....perfect! The chart shows a few rocks on the approach to Trollers Cove. our viewing, not touching, pleasure. The line was Wild Blue's route. While in Vancouver Pat discovered this awesome frozen croissant dough that rises to the occasion. Of course the Urban Fare market has all the good stuff. We put the frozen dough on a sheet for 8 hours then placed them in the oven. Wow, light, fluffy just like fresh croissants from Paris. (Whoops, I haven't been to Paris yet). A little bit of Paris in Ketchikan. Frozen Vancouver Bakery Croissants have risen. Baked for 15 minutes become light and fluffy. By 10am we were northwest bound in Tongass Narrows. At Vallenar Rock we turned to port using the Inside Passage to begin our crossing of southern Clarence Strait. The current was flooding up Clarence at about 2 knots but the 10 knot SE breeze was going the same direction, so the bump was minimal. By 12:30 we were ready to enter Trollers Cove and consulted Coast pilot directions. "Stay 50 yards off the S shore of the S Island....." which we attempted, but felt much safer at 100 feet. The submerged rocks did show up on sonar and we had about 50 feet of clearance on each side of the boat at the narrowest point. Alas, there was a single, empty, park mooring which Pat, standing on the stern swim step, threaded a line through the loop, and she walked forward while Alex backed down. When Pat reached the bow, it was a simple task to attach each end of the line to the forward hawser cleats at each side. The boat rode nicely for our two nights "at anchor". Nice view from the Trollers Cove mooring looking west. Forest cabin for recreational use by visitors.... and bears. Seeing no sign of the resident bear, Alex took the tender ashore for a stroll and to experience the forest cabin. The cabin was rustic, quiet and spooky, but looked fairly comfortable, if you're the mountain man type. A large wood stove was centered in the cabin. Four twin accommodations, BYOM (mattress). Alex hung around the cabin then eventually returnd to the boat by tender. Pat had previously opted out of a trip ashore based on the sailboat blogger bear "story". moving black rock, .....no a BEAR! He waved at us from a distance. The weekend was fun and Alex completed a lifetime first..... two consecutive victories over Pat in marathon "open dictionary" Scrabble. Yahoo! Earlier today, Monday morning that is, we slipped the bow line from our personal mooring for the short cruise back to Ketchikan. This time Clarence Strait was quite bumpy with a 2 knot southerly ebb being agitated by a 15 knot southerly breeze. The Admiral was unhappy but it didn't last as all was calm again shortly as we reached Tongass Narrows, then Ketchikan. Good morning from City Float in downtown Ketchikan. We arrived under the glow of city lights last night at 11pm ADT. Although it was dark for the last 90 minutes, our floods lit up all the floating debris allowing us to adjust course around it. City Float was packed with fishing, pleasure, and work boats so we opted for the unoccupied "passenger loading and unloading only" zone. We'll be asked to move to an appropriate moorage soon. We woke up the US Customs Service duty officer who promptly woke up another Customs Officer who inspected us at midnight. We passed muster and were allowed back into the USA. Ketchikan's City Lights last night. Over the last couple days we caught up on our sleep, installed the new galley sink faucet, and added more Sleemans Honey Brown to our stash. Except for beer, wine and liquor, the regular provisioning supply barge was delayed. The local innkeeper and fresh cookie maker was way behind on her orders so was happy to barter with us for eggs: a dozen for a baker's dozen cookies. Fresh, warm cookies were delivered to the Wild Blue and quickly devoured. At 6am Tuesday, the forecast was for building southeast winds up to 20 knots but Shearwater was quiet as we slipped our lines. We headed westbound in Seaforth Channel. The seas were pretty flat but the Admiral (Pat) still opted for the inside route via Reid Passage. We passed Westerly, another pleasure boat, who opted for the outside route, but eventually found her 4 miles ahead when rejoined the outside traffic lanes. The ride was uneventful until Jackson Passage. After passing Rescue Bay and clearing Jackson Narrows, we were forced to detour around two new log booms, two tugs with barges, and a prawner. A loggers housing and supply barge complete with heli-pad is newly moored in the Passage. The theme this year has been logs, logs and more logs, all headed south to the mills. Now Jackson Passage has become another source to satisfy what must be a huge lumber demand. There has to be a housing boom somewhere! The good news for us boaters: Jackson Passage has an additional source for excellent non-password protected free wifi. Of course we took advantage. Ivory Island Light at the Reid Passage turnoff. Log booms, wrangler tugs and foresters in Jackson Passage. Log harvesting helo for deep forest operations. More Jackson Passage logging activity. New logging camp in Jackson Passage with fast wifi! We continued past the Boat Bluff lighthouse and into Princess Royal Channel. It was a quiet ride with zero traffic. Usually we see a sports-fisher or five near Hartley Bay, but this year....nada! Lucky for us we seemed to somehow time the currents correctly so that we almost always had a "push", including nearly 2 knots up Grenville Channel. By 8pm, after 14 hours we were "pushed" into Lowes Inlet for the night. A highly productive day distance-wise, but rainy, overcast with little activity besides Jackson Passage. Pat prepared face-up apple turnovers to help with the gloomy surroundings. Verney Falls at high tide in Lowes Inlet. Pat's "face up" apple turnover. Being the only boat in Lowes Inlet is a first for us in the seven times we've anchored here. This is typically a busy anchorage being directly off the main thoroughfare to Alaska. After a restful night anchored directly in front of Verney Falls, we were ready to go on Wednesday at 7am. Not need to signal out right turn back into Grenville Channel, but there was traffic! The Mary B was just a few miles ahead going between 4 and 6 knots. we approached and eventually passed her, the only boat until nearing the top of the Channel. Mary B looks to be a barge that has been converted into a boat, of sorts. We noticed over time it would glide from one side of the Channel to the other, the driver correcting just before scrapping the side. Of course we hailed Mary B of our intention to pass, and the crew responded "She steers like a herd of sheep!" When ready to complete our pass, we added 200 rpms, but still almost got squeezed into the channel side. tried to give her a wide berth. By 9am the sun was breaking through and the wind and rains eased away. The day looked great at noon as we entered Chatham Sound, just southwest of Prince Rupert. The seas were glassy and flat so we knew we would easily make Dundas Island, the planned night's anchorage. This would make it easy to cross Dixon Entrance early tomorrow. And the Admiral was certain she wouldn't attempt to cross Dixon Entrance in anything but the best conditions! At 5pm PDT we rounded the northeast tip of Dundas to view a pleasant site: flat water all the way across the usually mighty Dixon Entrance. In 2008 we waited 3 days at Prince Rupert for the right conditioned to cross. Reluctantly the Admiral gave to order to push on to Foggy Bay. We checked in with US Customs via cell and obtained their permission to anchor at Foggy Bay then clearing in Ketchikan first thing tomorrow. This bay is about 2.5 hours from Dundas and offers excellent protection in all conditions. As expected, the Entrance was perfect even with a 3 knot ebb current! So by 6:30pm PDT, now 5:30pm Alaska Daylight Time, we're just off Foggy Bay in these totally excellent conditions, and once again, the Admiral orders the fleet to continue. And, after 16 hours of continuous motoring, we did arrive at 11pm in the blackness, just somewhat lighted by Wild Blue's headlights and the glow of the City of Ketchikan. Grenville Channel was starting to clear up. into Prince Rupert at 20 knots. Celebrity Solstice southbound after visit to Ketchikan. We're here for a few days then cruising to Sitka starting May 28th with a new crew. See you then. 2014-08 Gorge Harbour, Surge Narrows, Johnstone Strait, Queen Charlotte Strait to Blunden Harbour; Cape Caution, Pruth Bay to Kwakume Inlet, and finally to Shearwater..
Good morning from Shearwater in central British Columbia, about 75 miles north of the top end of Vancouver Island. Clouds, light rain and wind have re-started from the southeast after two glorious days of sunny weather. We arrived here yesterday at the Marina's noon checkout time to insure we'd have a spot at the dock. Another feat of excellent planning: of course the dock was completely empty, prompting Pat to exclaim "Oh, they've must not be open this year!" On Friday, after a first morning's light start from Gorge Harbour, we S-turned through Uganda Passage and bore right towards Beazley Passage. At Beazley we enjoyed 7:30am slack current, easily missing "boat rock" and relaxing through Surge Narrows. At Okisollo's Upper Rapids we were joined by the tug pushing a barge who had just squirted out of Hole-in-The-Wall from the east. Side-by-side with the pusher tug, we split Gypsy Shoal at Okisollo's Lower Rapids then merged onto Discovery Passage for it's last few miles to the northeast elbow in the middle of Vancouver Island. We then turned west into Johnstone Strait. A pusher tug joined us at Hole-In-The-Wall. We continued up Johnstone Strait in clearing weather, little wind and flat seas. We're thinking Lagoon Cove for the night, then decided the weather looked so calm we should continue further. Once we cleared Blackney Passage the sun appeared and the seas glassed off. The barometer was rising so we decided on Sullivan Bay, on the mainland side of the Inside Passage. At Wells passage, the Sullivan Bay turnoff, the conditions were so nice we just couldn't stop. Finally at 7pm near Blunden Harbor, we chatted about rounding Cape Caution. However Pat said 14 hours was long enough. We anchored in Blunden, and since one can't legally collect them, dreamed of Indian Beads. This first view of Queen Charlotte Strait looked awful good. We're up before the sun again today for the rounding of Cape Caution. The forecast looks good so we start today's trek at 5:30am. Outside along BC's mainland coast, there's some commercial traffic: the Pacific Titan with large container barge, the Zandaam and Radiance of the Seas with about 2,500 persons each, and the Matanuska with people and cars Alaska bound. On any waterway, especially where there's constrained navigational routes and plenty of commercial traffic, ships are controlled by Vessel Traffic Service or VTS. 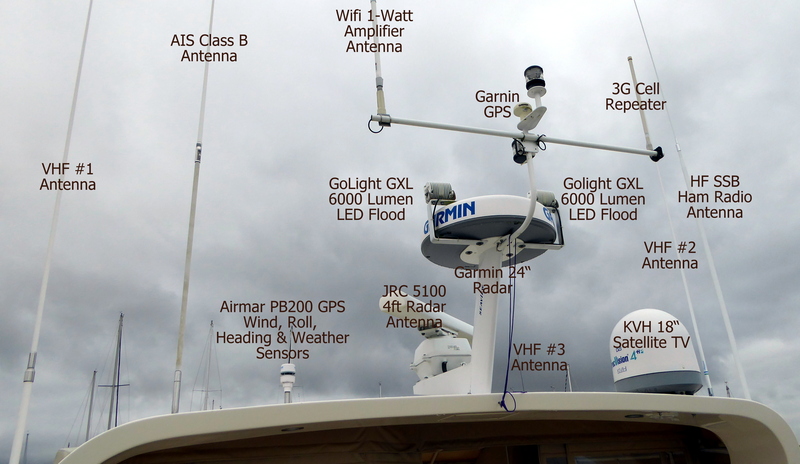 VTS is like an airport control tower and each ship checks into VTS when it enters a VTS area. 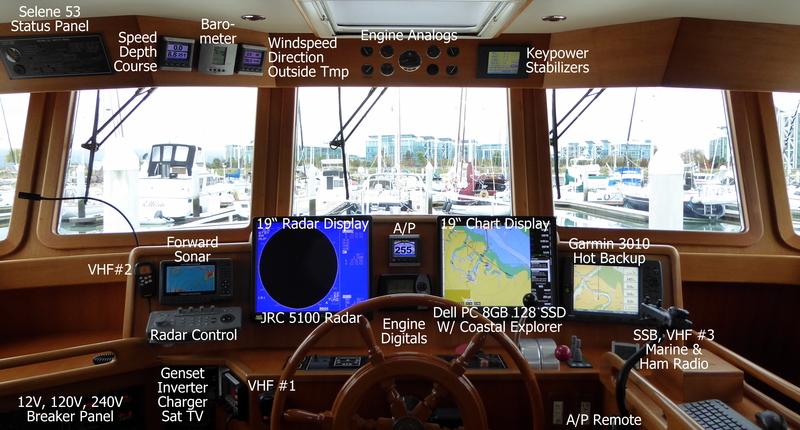 For our route from Vancouver, there's Vancouver VTS on VHF 12, then Comox VTS on VHF 71,and Price Rupert VTS on VHF 11. Although not required to check-in and be controlled by VTS, we listen in so as to become aware of ships headed our way. This has always been our practice while cruising. In the past, VTS acknowledged only other ships that have checked-in. So we were surprised to hear VTS announce "The non-participating ship Wild Blue on AIS northbound approaching Cape Caution". Both Comox and Prince Rupert VTS now announce AIS targets as well as ships that have checked-in which is a great help to ships in areas with poor AIS reception. We're always learning on the IP. The seas were rocking and rolling off the Cape and Pat wasn't too enamored. But all was better once we slipped inshore behind the rocks, reefs, and small islands that protect the inner waters near the surf line. The Cape Caution light seems so small for such a notorious cape. outside the surf line, but turns out to be less rolly. Matanuska, the Alaska ferry, Alaska bound. Once inside Calvert Island, the seas flattened and we motored along the western edge Fitz Hugh Sound. At 1:30pm we turned to port into Kawkshua Channel which leads to Pruth Bay. Pruth was empty, but we didn't anchor, or even try to catch another 57 lb halibut like in 2008. Instead we fired up the wifi and connected to the Hakai Lodge wifi system. 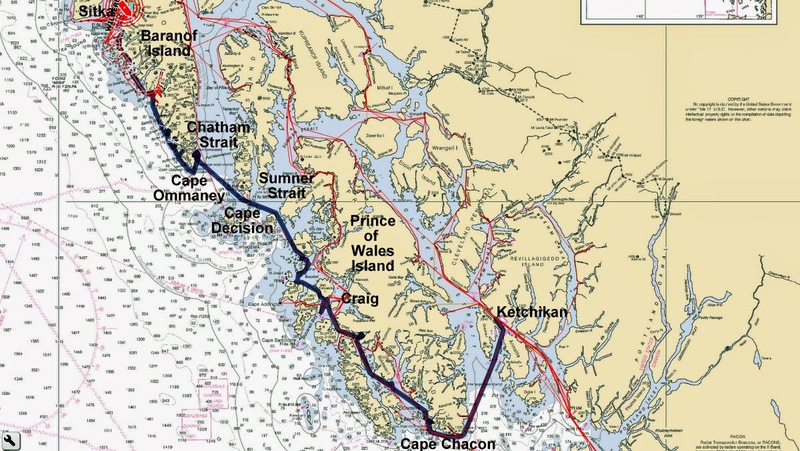 After email and Google news fixes, we made a U-turn back out Kawkshua Channel, dodged two humpbacks, crossed Fitz Hugh Sound to Kwakume Inlet, where we anchored for the night. This year there's loads of logs moving south on the IP. ......The Lois H is towing another log barge. ....... And bringing along her own "wrangling tug". A wrangling tug at work. Hold on and don't take off your life vest! There's a submerged rock in the middle of Kwakume Inlet. Lucky for us it was well-marked by these seals. At the lazy hour of 8am we pulled the hook and set off to Shearwater. We'll be here for at least two nights while we have a few mechanical items serviced. Canadian Coast Guard Station Denny Island, BC. Seattle, it's good practice to display the home team "fan" banner.